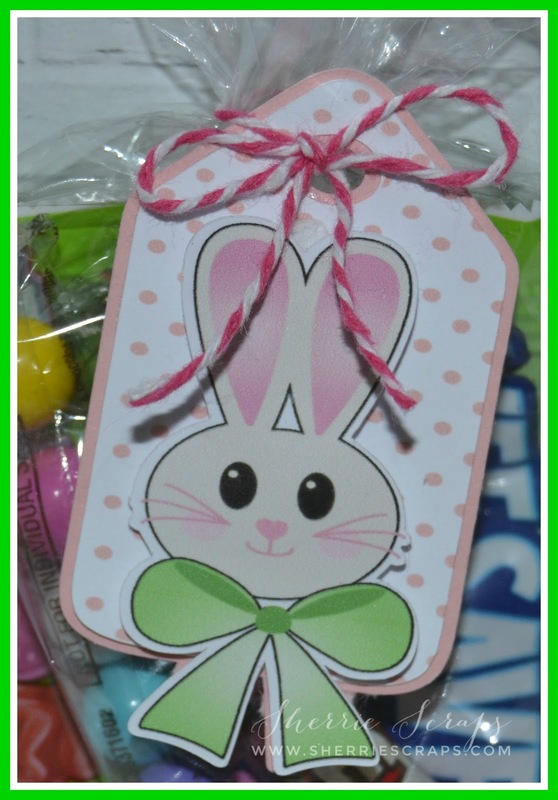 I have quick and easy Easter treat to share using this adorable print and cut file from the Silhouette store #185359 called Easter Bunny Tag for these treats. When you are looking for a quick project, print and cut is the way to go. So easy especially for mass producing! Arya helped me, once again put these together....such a big helper! 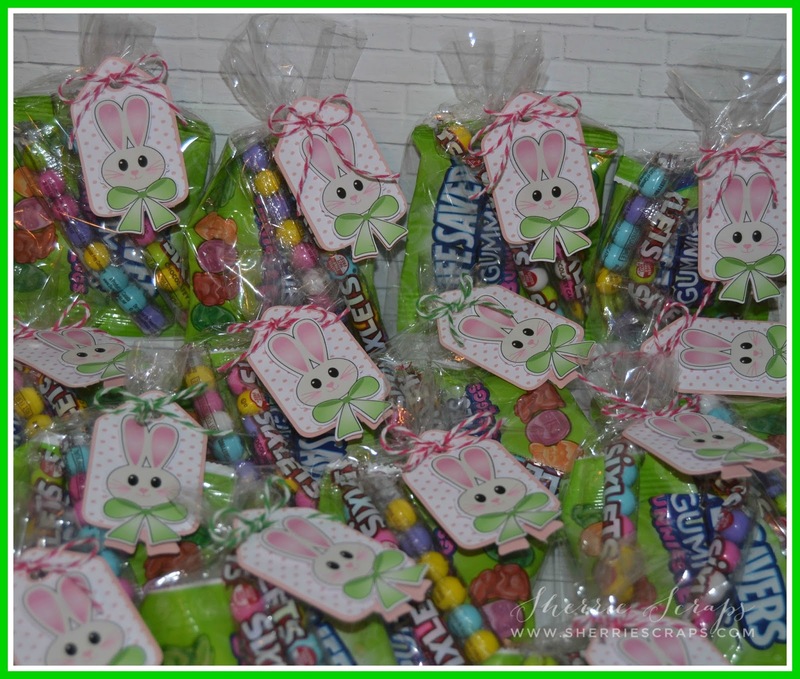 I selected my size, printed and cut and all the pieces and quickly put together 30 of these for attaching to a treat bag for sweet Lacy and Ailey (my other 2 Granddaughters) to hand out at their daycare. I filled each cello bag with Easter Lifesaver Gummies and chocolate sixlets. 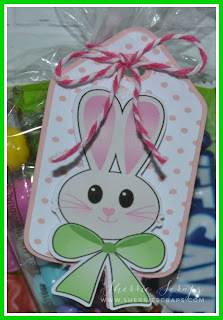 I tied the cute little tags on with twine from my stash and stamped Happy Easter on the back...super easy! These are soooooooooooo cute!!!! I hope everything is ok with your dad! Sending love and prayers!!!!!!!!!!! I have kept your dad in my prayers and will continue to do so.My love and prayers go out to you & your family as well. Super cute & yummy treats my friend. I hope your Dad is doing better today, Sherrie. I'm keeping him and your family in my prayers. These are so sweet and adorable!! You and Arya did an amazing job with them!! The bunnies are so cute!! The kids will adore these!! Thinking of you my dear, sweet friend. Saying lots of prayers and sending huge hugs to you. 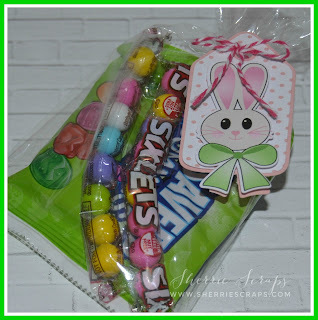 Sherrie, these little bunny treat tags are so cute! I'm so very sorry to hear about your Dad. Keeping him and your family in my prayers. Oh my word...these are absolutely adorable! What sweet little bunnies and such a fun treat bag. I am so, so sorry to hear about your dad! Keeping all of you in my thoughts and prayers! LOVE your treat bags with those adorable tags! You really make the cutest treat sets ever! I can't believe it happened again Sherrie... So sorry for your Dad... Sending tons of Prayers to your family.... Your treats are super sweet! Big HUGS! So fun!! And how wonderful that you and Arya worked together to make these for the little ones to share. Gotta love print and cut!! I don't use it nearly enough!